US sanctions against Russian aluminium producer, Rusal was the key driver behind increased volatility in the market over much of 2018. This was no surprise, given that the company is the largest producer outside China, making up around 13% of total ex-China supply. However as the year progressed it became clear that the US Treasury and Rusal were both keen to come to a deal which would see the lifting of Rusal sanctions. The US Treasury finally announced its intention to remove sanctions against Rusal in December, and these were successfully lifted on 27 January, despite attempts from US Democrats to block this move. Despite it being largely expected that sanctions would be removed, confirmation of the news has put renewed pressure on LME aluminium. The concern is that unsold Rusal stock would now weigh on the market. 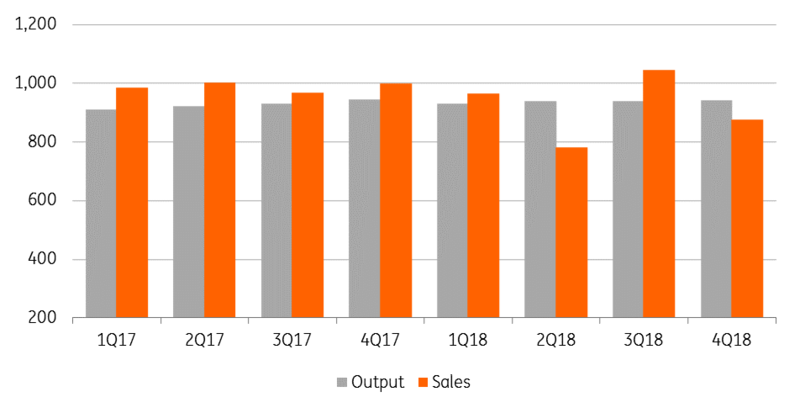 However when looking at Rusal production over 2018, along with sales, the build-up in inventory over the year does not appear to be significant. Rusal output totalled 3.75mt over the year, whilst sales totalled 3.67mt - leaving a stock build of 82kt. Still the concern is that, following the lifting of LME restrictions, some of this material could make its way into LME warehouses, . The lifting of Rusal sanctions does not change our outlook for the market. We were assuming that these sanctions would be lifted, and so see litttle impact in terms of supply. We are still estimating that the ex-China market will see a sizeable deficit over 2019. But clearly the Rusal decision has weighed on sentiment in the short term. Another factor clearly weighing on sentiment is fairly weak premiums. European premiums have edged lower for several months now - US tariffs are not helping regional premiums elsewhere, whilst the threat of Rusal material is also weighing on premiums. Weaker premiums have not been supportive for the market, with this doing little to stop the inflow of material into LME warehouses. Since early December LME inventories have increased from 1.04mt to around 1.3mt. In Asia, premiums have also been weaker, Japanese spot premiums are trading at around US$77/t, down from over US$90/t in October. Japanese buyers have agreed quarterly premiums for 1Q19 of US$83-85/t, compared to US$103/t in the previous quarter. However, in the US the Midwest premium remains well supported. This shouldn’t come as too much of a surprise given the 10% tariff that was introduced under section 232. One of the key themes over much of last year, was the fact that smelter margins were getting squeezed. Producers were having to deal with rising input costs, with both energy and alumina prices strengthening over much of the year. This pressures have eased somewhat. Looking at the coal market, API2 coal prices have fallen around 25% since late October. Meanwhile on the alumina side, the lifting of Rusal sanctions has also provided clarity over Rusal’s alumina supply. Additionally over the course of 2018 China switched from a net importer of alumina to a net exporter, with attractive prices on offer in the world market. Finally the market is moving more towards the view that the Alunorte alumina refinery in Brazil will return to full operations at some stage this year, which should keep the alumina market well supplied. 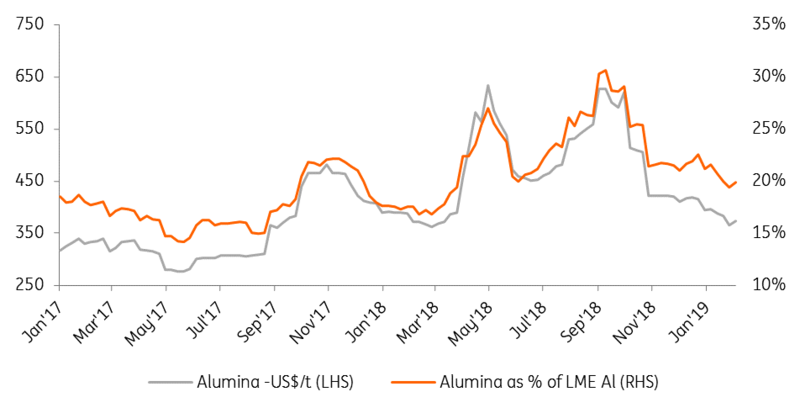 This has seen alumina prices falling from levels as high as US$640/t over parts of 2018 to around US$370/t currently. 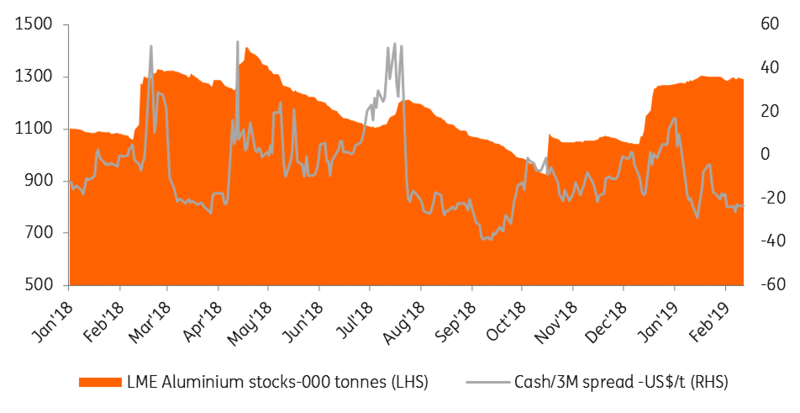 The alumina/aluminium price ratio has fallen from a peak of 31% in September 2018 to 19% currently. However we do believe that the market may be too complacent around alumina supply, especially with the return of full operations at the Alunorte refinery in Brazil. Following the unfortunately fatal Vale dam accident, regulatory pressures are likely to grow for the metals and mining industry in Brazil. Therefore the government may be hesitant to give the final go ahead to Hydro at the moment. 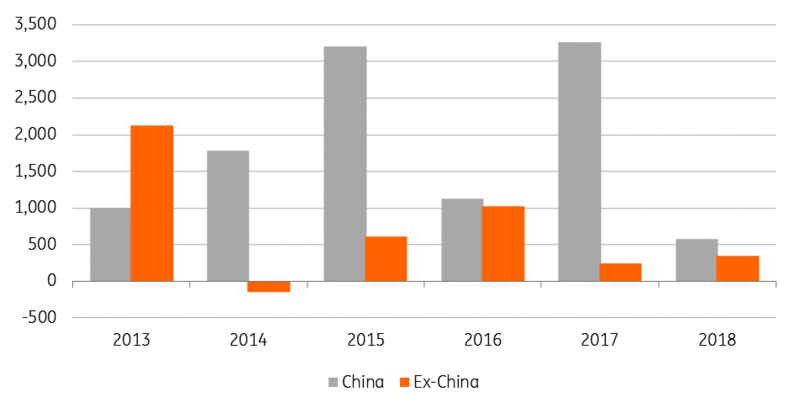 The aluminium market has a structural issue - the bulk of current supply growth is coming from China, whilst ex-China growth is still falling short of the level needed to fill the ex-China deficit. Over 2018 Chinese primary production grew by 580kt to hit a record 36.49mt. This stronger production comes despite winter cuts, and the shutting of “illegal” capacity in the summer of 2017. Meanwhile the story of restarts and new capacity has been more an ex-China one - output over 2018 only increased by around 350kt. Outages and tighter smelter margins over 2018 did little to support the needed growth in production outside China. Expectations are that we will once again see a large ex-China deficit - somewhere in the region of 1.8mt. Meanwhile the Chinese surplus is forecast to be in the region of 300kt, leaving a global deficit of around 1.5mt. The size of this will depend on how well demand holds up over the course of the year, especially in the current environment.